Abilene Fastener supply carries all of the contractor supplies that you need to supplement all of your worksite projects. We carry all of the tools and devices that you rely on to finish the job accurately and efficiently such as measurement tools, levelers, roofing supplies, abrasives and finishing supplies. We also know how important worksite safety is so we carry a full line of fall protection equipment, firestop, and various other safety devices and equipment. If you’ve ever heard of the term "measure twice and cut once" then look no further. Here at Abilene Fastener Supply, we carry all your marking and measuring needs. Whether you’re in the need of specialty laser measuring equipment or simply conventional tape measuring methods, we carry an extensive line sure to meet your specific needs. Many construction professionals are finding that the use of laser leveling devices not only saves time and money but also allows you to quickly and accurately get your angles and measurements right the first time. Abilene Fastener sells and services specialty laser leveling devices that can be used for an array leveling needs including; machine control, excavation work, landscaping, plumbing, swimming pool construction, measuring elevation, measuring distance, commercial and residential roofing, site-prep grading, construction stake out, concrete leveling, custom home building, and many various construction applications. Abilene Fastener Supply is West Texas authorized Trimble/Spectra® and Hilti® dealer. "Hail yes we got what you need!" Abilene Fastener Supply is your roofing contractor supply head quarters. We carry a wide variety of sealants, nibblers, fall protection, specialty roofing hammers and hook blades, not to mention all the compressors, fasteners, and tools you'd ever need. 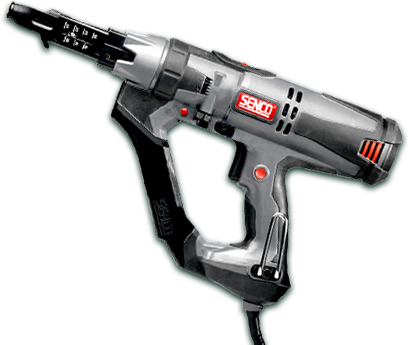 For more information on our wide line of roofing compressors and pneumatic tools please visit our tools page. Need more grit? Check out Abilene Fastener Supplies wide variety of abrasives and grinding discs for all types of rotary and hand tools. We specialize in carrying those hard to find abrasives as well as those in high demand. Everything from fine grit sandpaper to diamond cutting cobalt, we have you covered. Interested in air sanding? Ask one of our sales professionals about our line of air sanders from Dynablade® today! In addition to our extensive supply of abrasives, Abilene Fastener Supply carries a wide variety of finishing supplies including buffers, polishers, and accessories for all types of surfaces including wood, granite, metal, marble, tile, concrete, and stone. Come by our show room today and check out all we have to offer. Fire safety is nothing to take your chances with, so make sure your patrons are protected using the best Firestop protection around. Abilene Fastener carries a wide variety of Firestop protection systems and sealants from only the most trusted suppliers including; Hilti® Firestop, Spec Seal® Firestop, EZ-Path®, Franklin International®, Chemlink® and many more. Unfortunately, there's no magic rescue button you can push when you’re falling off a 30 foot roof top. So be sure and protect yourself with only the best fall equipment around. Here at Abilene Fastener we carry a wide range of harnessing, rigging, and fall equipment accessories for all of your high risk projects. Stop by or call today at 325-673-9200.